light extraction from the die. 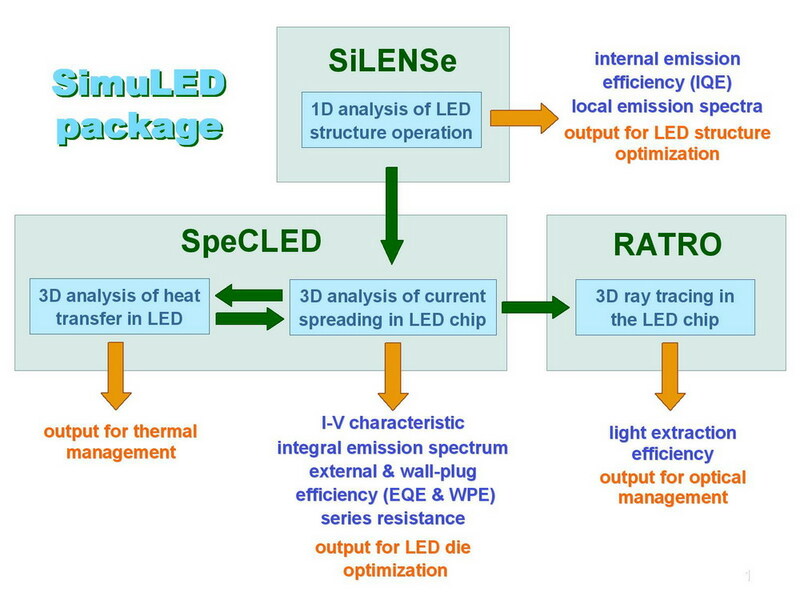 The SimuLED software is based on an advanced multi-scale approach to LED and LD modeling. The simulator can be used for design and optimization of various devices operating in UV, IR, and visible spectral ranges, fabricated from AlGaInN, GaAsP, AlGaInAs, AlGaInP, and ZnMgO semiconductor materials. An accurate drift-diffusion model is applied to the carrier transport, recombination, and light emission in the heterostructure, while the current spreading in an LED/LD die is simulated using the advanced hybrid approach. This makes computations very fast while reflecting the essential physics of processes occurring in the LEDs/LDs. The self-heating and current spreading in the die are simulated self-consistently which is especially important for optimization of high power devices. The SimuLED package consists of 3 compatible software tools: SiLENSe, SpeCLED, and RATRO. The SiLENSe package is designed for 1D drift-diffusion analysis of electron and hole injection into the active region, and their radiative and non-radiative recombination. All important recombination channels are taken into account, including Auger recombination and recombination on threading dislocations inherent in Group-III nitride heterostructures. The software predicts the current density as a function of local bias applied to the p-n junction and provides such important characteristics as internal quantum efficiency (IQE), emission spectrum, and detailed information on the carrier distribution across the heterostructure. SiLENSe is a tool for heterostructure development and optimization, and can be useful for both device and crystal growth engineers. The SpeCLED package provides 3D analysis of current crowding and temperature distribution in the LED dice fabricated on either insulating or conductive substrate. It supports simulation of planar and vertical chips with one-side and two-side electrode configurations. The package enables optimization of both blocking and ITO-like spreading layers that have become important units of advanced LED chips. SpeCLED uses the computational results obtained by SiLENSe to specify the current density as a function of local bias applied to the active region and supposes Ohmic behaviour of neutral contact layers far from the active region. This tool is widely used for optimization of contact electrode geometry and predicts the actual temperature of the active region as a function of operation conditions. RATRO (Ray-Tracing Simulator of Light Propagation) is a 3D ray-tracing simulator of light propagation, absorption, and extraction from the LED die. The RATRO package uses the information on the light emission intensity distribution in the LED active region obtained by SpeCLED. Then the package computes the light intensity distribution over all the die surfaces, the far-field distribution, and integral chip characteristics like extraction efficiency, total light output, light polarization, etc. The ray-tracing model accounts for the light refraction, reflection, and absorption on both smooth and rough surfaces/interfaces, using advanced optical models of regular/random surface patterning.